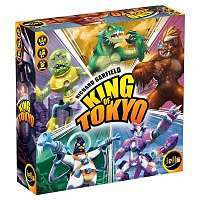 The fiercest player will occupy Tokyo, and earn extra victory points, but that player can’t heal and must face all the other monsters alone! Top this off with special cards purchased with energy that have a permanent or temporary effect, such as the growing of a second head which grants you an additional die, body armour, nova death ray, and more! In Concept, your goal is to guess words through the association of icons. Choose a word or phrase that the other players need to guess.